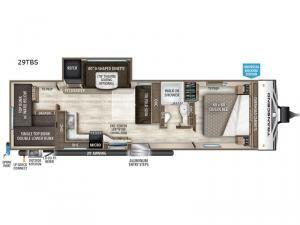 Sleeping space for ten is easy to manage with this Transcend travel trailer which includes a double and two single bunks, a tri-fold sofa, a queen bed, and an 80" U-shaped dinette. Cooking will also be a breeze for your entire crew with the added outdoor kitchen. You can easily whip up large meals with a two-burner cooktop outside and a three-burner range with oven and overhead microwave indoors. The private front bedroom and rear private bunkhouse allow for quiet spaces to relax and unwind for both adults and children. A convenient full bath near the entry door is just what you need to accommodate all guests, and the rear bumper spray port makes it easy to spray off dirty and sandy feet after a full day of outdoor fun. You will also find the pet drawer beneath the refrigerator handy for keeping the family pet easily fed.